Each grass that we grow has different uses in landscaping and in your garden. Some are more drought tolerant and others are known for hardiness. Ornament grasses are a vital part of landscaping today. Grasses are useful in providing texture and variety when other plants are yet to bloom or have finished blooming. Some can grow as tall as 12 feet while others are small clumps. 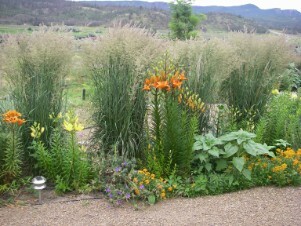 One of the common misconceptions is that ornamental grasses spread and are invasive. While this is true of some types of grass, most are of the clumping variety and they are safe to put with your other plants. Grasses you may want to avoid because of their invasive qualities are "Ribbon grass" and "Lyme grass", although these grasses are used in slope stabilization because the very quality that gardeners want to avoid is most useful in helping to stabilize soil on slopes. If an 'invasive' grass thrives with moisture, its growth can be kept in check by limiting the amount of water it gets. Phalaris "Strawberries & cream" is a wonderful example of a spreading grass that is successfully grown in the right place.